The present invention relates to a process for producing an oxidised cellulose pulp fibrillar network comprising the following steps: (a) oxidising a cellulose pulp to obtain about 0.3 to 2.5 mmol carboxylic groups per gram cellulose pulp; and about 0.1 to 5.0 mmol aldehyde groups per gram cellulose pulp; and (b) homogenisation of the cellulose pulp of step (a) wherein the cellulose fibres are refined to provide a cellulose pulp comprising 0-50 % of fibres having an average length 0.7 mm - 2.1 mm; and 50-100 % of fibres having a particle size of 0.05 -500 micrometer (μm). Also step (c) drying of the cellulose pulp obtained by step (b) may be included in the process. The present invention relates to a process for producing a homogenised oxidised cellulose pulp. The cellulose pulp can be further processed by a step of drying into a cellulosic absorbent product having a stable fibrillar network giving high absorption capacity. The invention relates also to the cellulosic absorbent products and its uses. Absorbent materials are used in many different applications, for example in sanitary articles and in wound healing articles. The common requirement is high absorption capacity of the products. There are many different methods available for modifying and optimising the absorption property and capacity of the absorbent material. To this is also connected the property to retain the liquid after absorption, also when the product is put under pressure, which is an important aspect within some fields and applications. Processes for producing products having a specified pore volume, giving an improved absorption capacity, are known from EP 0 209 884 A2 and EP 0 210 570 A1 . These documents describe processes where pore generating particles are added during cross linking process of micro fibrillated cellulose for preparing absorbent retentive pulp. The processes require additional process steps for removing the pore generating particles. US 5 104 41 1 describes an absorbent product comprising a cross-linked and freeze dried microfibrillar pulp. The cellulose fibres, originating from, for example chemical wood pulp, are beaten and cross-linked before the step of freeze drying. The chemical pulp is not pre-treated by any oxidation. US 2003/0073663 A1 describes a process for oxidation of cellulose derivatives, such as methyl cellulose, and ethyl cellulose. The oxidised cellulose derivates are to be used as bio absorbable medical devices. The oxidation is carried out by exposing the cellulose derivative to nitrogen oxide in an inert solvent such as carbon tetrachloride. EP 1 325 754 A1 describes a wound dressing material comprising oxidised cellulose, wherein the oxidised cellulose is combined with structural protein and in form of sponge or film. The cellulose has preferably an average molecular weight greater than 50 000 and the oxidised cellulose is preferably oxidised regenerated cellulose (ORC). WO 95/07303 describes a method for oxidising carbohydrates with high specificity, by using hypochlorite in the presence of nitroxyl compounds such as 2,2,6,6-tetramethylpiperidin-1 -oxyl (Tempo). The oxidation is performed in an aqueous reaction medium at a pH of between 9 and 13. It is said that the process provided gives increased yield of oxidised carbosaccharides, with less side-reaction. Also EP 1 149 846 describes a process for oxidation of polysaccharides with hypochlorite in presence of, for example, 2,2,6,6-tetramethylpiperidine-1 -oxyl. The oxidation process herein described is performed in absence of a bromide catalyst. In T Saito, A Isogai, Biomacromolecules, 2004, 5, 1983-1989 a method to oxidise cellulose pulp originating from cotton linter with 2,2,6,6-tetramethylpiperidin- 1 -oxyl (Tempo) is described. In T Saito, et al., Biomacromolecules, 2006, 5, 1689-1691 a method including oxidation of cellulose pulp originating from cotton linter with 2,2,6,6- tetramethylpiperidin-1 -oxyl (Tempo) followed by a homogenisation is described. However, there is a need for cellulosic absorbent materials having high absorption capacity produced by efficient and economical processes, also without using additional components, such pore generating agents, cross-linkers etc. There is also a demand of environmentally friendly processes. The present invention provides a process for producing a cellulosic absorbent material comprising a fibrillar network having high absorption capacity and a three dimensional structure which do not collapse after absorption of liquid. The object of the invention is to provide a process for producing cellulosic absorbent material. Another object of the invention relates to the products obtained by the process. The absorbent material can be used in a wide range of applications, such as incontinence articles and diapers; for wound care products, such as plaster, for absorption of bodily fluids from wounds, for example in form or plaster and bandage. Other areas for application of the products obtainable by the process of the invention, to utilise the hygroscopic properties, are as humidity absorbers and high- absorbing paper products. Further, absorption of liquids is important in many areas, for example in transportation and storage of food, such as fish and meat..
By the invention a process is provided where the cellulose pulp in the first step (step (a)) is treated by oxidation into a product where hydroxyl groups of the glucose units of the cellulose polymer are oxidised. The morphological property is changed due to that the amount of aldehyde and charged groups is changed, thus the hydroxyl groups substituted on the glucose units are transferred into aldehyde- and/or carboxylic acid groups. The presence of aldehyde groups is important for the product obtained by the process as defined by step (a) to step (c) as these participates in creating the fibrillar network by which a high absorption capacity is achieved. The three dimensional structure is obtained by the process as defined in step (a) to step (c). (measured with Malvern Mastersize 2000). The process may comprise a further optional step, the step (c): drying of the cellulose pulp fibrillar network provided by step (b). The present invention relates also to the products obtained by the process of the invention, as well as to the products provided by the different steps of the process of the invention, thus from step (b) and step (c). By the process of the invention a method to modify the cellulosic material to contain a large amount of aldehyde and carboxylic groups is provided. The new chemical composition results in an enhanced stability of the three-dimensional structure, for example of the porous foam. The process provides also a product having a high surface area (BET surface area). Thus the product has a large area accessible for liquid absorption, and also, the capillarity is improved which may provide a good retention of the liquid absorbed. Hence, by the process of the invention products having improved absorbing, liquid spreading and liquid storage properties are obtained. The cellulose suitable for the present invention is of any lignocelluloses material. By the term 'cellulose pulp as starting material' it is herein meant the cellulose pulp as is introduced in step (a) of the process of the invention. The cellulose pulp as starting material may be obtained by suitable treatment of softwood or hardwood. Softwood is for example, spruce fir, pine tree and larch. Generally, the softwood has an average fibre length of 1 to 5 millimetres, depending on types of wood. Hardwood is, for example, birch, beech, ash, aspen, eucalyptus. Hardwood fibres have an average length of 0.5 to 3 millimetres. The cellulose pulp as starting material may also be selected from recycled paper products, for example recycled paper pulp formed from mill broke, pre- consumer waste and post-consumer waste or mixed office waste. Other sources of cellulose pulp are annual plants like rice, bamboo, and bagasse. (ECF). The cellulose pulp as starting material can be selected from pulps having been dried, or never dried, during the processing. Preferably, the cellulose pulp as starting material for the process of the invention is bleached cellulose pulp. The cellulose pulp as starting material, thus the suspension of the cellulosic material suspended in the liquid system, comprises at least 60 % by weight of cellulose material, for example about 65, 70, 75, 80, 85 or 90 % by weight of cellulose material. Preferably, the cellulose pulp as starting material comprises about 70 % by weight of cellulose material. Any commercially available cellulose pulp may be suitable for the process of the invention. The cellulose pulp as starting material may be refined before it is introduced to the step of oxidation (defined as step (a)), for example by additional steps of mechanical treatment before the oxidation step (a). This may be advantageous when considering optimisation of energy demand of the process. Also, steps like removal of impurities may be added to the process of the invention, for example before step (a). Another option is to remove impurities during the process of the invention, for example within or after step (a) or step (b). The process of the invention includes a first step of oxidation (step (a)) of the glucose units. Cellulose is a linear polymer comprising repeating D-glucose units linked by 3(1 -4)-glycosidic bonds. The chemical structure of the cellulose molecule is shown by Formula I wherein n is normally up to 5000. Preferably, the oxidation in the process of the invention is specific on the hydroxyl group positioned on the carbon-6 of the glucose units of the cellulose (marked by arrows). The oxidation can be performed by addition of one or more suitable oxidising agent(s). The term oxidising agent is an agent which oxidise the hydroxyl groups on the glucose units of the cellulose chain. The oxidation of cellulose can be performed by any suitable process. Examples of oxidising agents are periodates, such as sodium periodat (Nal04), and N204. The concentration of the oxidising agent may be about 0.5 to 50 mmol / g cellulose pulp (oven dried). Preferably the concentration is about 1 to 30 mmol/g cellulose pulp (oven dried). In another method the oxidation can be performed by free radical reaction. Such a process must be started by the introduction of an initiator. One option for the free radical reaction is to initiate the reaction with a catalytic agent generating free radicals. Another option to initiate the free radical reaction is by adding energy, for example by exposure of the reaction mixture with ultraviolet radiation, or by heating. The present invention is not limited to any of these oxidation methods. The oxidation results in an oxidised cellulose pulp. By the term Oxidised cellulose pulp' it is herein meant the cellulose pulp as is obtained in step (a) of the process of the invention, wherein the glucose units of the cellulose have been oxidised to certain degree. The oxidising agent in a free radical reaction is a carrier of the free radical required for the oxidation process according to the present invention. Examples of oxidising agents acting together with a catalytic agent are hypohalites and peroxides. The hypohalites are for example hypofluorites, hypochlorites, hypobromites, and hypoiodites. More specifically, the hypohalites may be selected from hypochlorites such as sodium hypochlorite (NaOCI), potassium hypochlorite (KOCI), lithium hypochlorite (LiOCI), or calcium hypochlorite (Ca(OCI)2). The list of examples of oxidising agents is not exhaustive. For the process according to step (a) the alkalimetal hypochlorite and the alkalimetal hypohalite may be based on the same alkalimetal, or different alkalimetals, selected from lithium, sodium and potassium. Sodium is the preferred alkalimetal for the oxidation process according to step (a). The oxidation of the cellulose pulp according to step (a) is performed until at least 0.3 mmol carboxylic groups per gram cellulose pulp; and at least 0.1 mmol aldehyde groups per gram cellulose pulp are obtained. Preferably, about 0.3 to 2.5 mmol carboxylic groups per gram cellulose pulp; and about 0.1 to 5.0 mmol aldehyde groups per gram cellulose pulp is obtained during this process step. 4) adding to the suspension a catalytic amount of a catalytic agent. During the oxidation reaction the pH of the suspension may be adjusted to between about 8 to 13, for example between 8 and 10.5, by adding an alkali agent. In the step of oxidation as defined above, thus the step (a), the different separate steps 1 ) to 4) may be performed either simultaneously; in any order; or sequentially step 1 ) to step 4). Another option is an oxidation reaction where two or more of steps 1 ) to 4) are combined and performed simultaneously. In one embodiment of the invention the oxidising agent is selected from the group consisting of lithium hypochlorite (LiOCI), potassium hypochlorite (KOCI), sodium hypochlorite (NaOCI) and calcium hypochlorite (Ca(OCI)2). The preferred oxidising agent is sodium hypochlorite. The concentration of the oxidising agent is about 0.5 to 50 mmol / g cellulose pulp (oven dried). The oxidising agent is preferably added in an amount of at least 1 mmol of the oxidising agent per gram cellulose pulp. For example the concentration is about 1 to 30 mmol/g cellulose pulp (oven dried). Further examples are processes wherein the oxidising agent is present in an amount of about 1 - 10 mmol/g cellulose pulp, for example about 2-6 mmol/g cellulose pulp, such as 1 , 1.5, 2, 2.5, 3, 3.5, 4, 4.5, 5, 5.5, 6, 6.5, 7, 7.5, 8, 8.5, 9, 9.5 or 10 mmol/g cellulose pulp (oven dried). These amounts are required for obtaining the amount of carboxylic groups and aldehyde groups creating the three dimensional structure giving high absorption capacity. The content of carboxylic groups may be measured and determined by any known method, a non-limiting example is by sorption of methylene blue. This method is further described in P Fardim, B Holmbom, J Karhu, Nordic Pulp and Paper Research Journal, 2002, 17:2, 346-351 , which is incorporated herein by reference. A catalytic agent may be added to initiate and to catalyse the free radical reaction. By the term 'catalytic agent' it is herein meant an agent which initiates and catalysis the free radical reaction. One example of catalytic agents is peroxides. Another example is organic nitroxyl compounds, such as 2,2,6,6-tetramethylpiperidin-1 -oxyl (Tempo), 2,2,5,5,- tetramethylpyrrolidine-N-oxyl (Proxyl), 4-hydroxy-2,2,6,6-tetramethylpiperidin-1 -oxyl, and 4-acetamido-2,2,6,6-tetramethylpiperidin-1 -oxyl, and derivatives thereof. These catalytic agents reacts with selectivity on carbon-6 of the glucose unit of the cellulose molecule. The organic nitroxyl compound 2,2,6,6-tetramethylpiperidin-1 -oxyl (Tempo) is the preferred catalytic agent for the process of the invention. The 2,2,6,6- tetramethylpiperidin-1 -oxyl (Tempo) shows stability during the reaction and can also be recovered and recycled from the process which is an important aspect from both economical and environmental perspectives. The catalytic amount of the catalytic agent is about 0.005-5 mmol / g cellulose pulp (oven dried). Preferably the concentration of the catalytic agent is about 0.01 - 3 mmol/g cellulose pulp (oven dried). In one embodiment of the invention the catalytic agent, when being an organic nitroxyl compound, is added in a catalytic amount, for example in an amount of 0.01 - 0.5 mmol/g cellulose pulp (oven dried), preferably between 0.05-0.2 mmol/g. In one embodiment of the invention the catalytic agent is 2,2,6,6- tetramethylpiperidin-1 -oxyl (Tempo). In addition to the catalytic agent also a co-catalyst may be added. Examples of co-catalysts are alkali metal bromides, for example sodium bromide (NaBr), potassium bromide (KBr), lithium bromide (LiBr), and calcium bromide (Ca(Br)2). The alkali metal bromide reacts with the alkali metal hypochlorite to form alkali metal hypobromite during the reaction. By the presence of this co-catalyst a higher yield may be expected as the amount of side reactions may be reduced. The co-catalyst is preferably added to step 1 ). The concentration of the co- catalyst may be 0.005-50 mmol/g cellulose pulp (oven dried); for example 0.5-20 mmol/g; and a further example 0.2-10 mmol/g. The preferred co-catalyst is sodium bromide (NaBr). c) co-catalytic agent NaBr in an amount of: 0.2-10 mmol/g. c) co-catalytic agent NaBr in an amount of: 0.7-3 mmol/g. At the start of the process according to step (a) the cellulose pulp shall have a pH of between about 8 and 13, for example between 8.5 and 10.5. This pH range is then, preferably kept during the whole oxidation process. This pH range has been found to be the most efficient and economical for the oxidation reaction. The oxidation treatment of the pulp is preferably performed at pH between about 8 and 1 1 , for example between about 8.5 and 10.5. Other examples are, at pH 8, 8.5, 9, 9.5, 10, 10.5, 1 1 , 1 1.5, 12, 12.5 and 13. The pH can be kept in a range of pH between about 9 to1 1 , for example between 9.75 and 10.25. The alkali agents are preferably added continuously but may also be added intermittently during the process. By the term 'alkali agent' is meant alkaline compounds like hydroxides and carbonates, such as alkali metal hydroxides and alkali metal carbonates. The alkali agent may optionally be selected from the group comprising lithium hydroxide (LiOH), potassium hydroxide (KOH), sodium hydroxide (NaOH), calcium hydroxide (Ca(OH)2), lithium carbonate (Li2C03), potassium carbonate (K2C03)), sodium carbonate (Na2C03) and calcium carbonate (CaC03). In the process of the invention the oxidation treatment according to step (a) is performed at a temperature of between 5 and 160 °C, for example, between 10 and 95 °C, between 10 and 70 °C , such as between 15 and 60 °C. Further examples of suitable reaction temperature are about 15, 20 ( i.e. room temperature), 25, 30, 35, 40, 45, 50, 55, and 60 °C. When the temperature is about 100 °C or above, the reaction shall be performed at increased pressure in suitable equipment. Temperature selected during the process of the invention may depend on application and use of the final product. At higher temperature, inter alia, at temperature above 150 °C, there is a potential risk for discoloration of the cellulose pulp. Avoidance of discoloration of the product may be an important aspect from an aesthetical perspective when the product is to be used in, for example, health care or sanitary products where the appearance and cleanness is important for the customer. In connection to the step of oxidation also one or several additional steps of separating the cellulose pulp from the liquid system forming the suspension as obtained after step (a); and washing. The separation, and subsequent washing, of the solid material from the liquid may be performed by any processes known in the art, such as filtration in any filtration equipment, gravitational separation methods such as centrifugation; cross-flow filtration (tangential flow filtration). Other examples are membrane filtration, and nano-filtration. The list of methods is not exhaustive. The liquid system which has been separated from the oxidised cellulose pulp may, with advantage, be re-circulated. By that, the components, like the catalytic agents, co-catalysts, oxidising agents etc, are also recycled or re-circulated and can be re- used in the process. Hence, the process of the invention may comprise an additional step wherein the liquid system, comprising the catalytic agent, co-catalyst and oxidising agent, is re-circulated to step (a). Optionally, before entrance to the following step (b) a portion of the liquid system may be added to the oxidised cellulose pulp to create a suitable viscosity of the suspension. The viscosity depends on the apparatus used and is well-known to the skilled person. The pulp obtained after the oxidation as described above is further processed by homogenisation. During the oxidation reaction the fibres in the cellulose pulp are chemically treated, and products having certain amounts of carboxylic acid-, and aldehyde-groups are obtained. By the following homogenisation the cellulose is mechanical treated to provide a cellulose product fibrillar network having a certain size and shape. By the term Oxidised cellulose pulp fibrillar network' it is herein meant the cellulose pulp as is obtained in step (b). The homogenisation of the cellulose pulp of step (a) is performed until the cellulose fibres are refined into a cellulose pulp comprising 0-50 % of fibres having an average length of 0.5 mm - 2.5 mm, and 50-100 % of fibres having a particle size of 0.05 -500 micrometer. The size of the fibres may be measured by different methods and equipments. Herein the average length of the fibres has been measured with Kajaani FS-300, and the particle size has been measured with Malvern Mastersize 2000. Preferably, the homogenisation is performed until the cellulose pulp comprises 0-50 % of fibres having an average length of 0.7 mm - 2.1 mm and 50- 100 % of fibres having a particle size of 0.05-500 micrometer (fibre length and particle size are determined by measurements as defined above). In the step of homogenisation the oxidised pulp is suspended together with a liquid system to a mixture having a solid content of 0.1 - 30 % by weight, for example 0.2 - 20 % by weight, or 0.3-15 % by weight, or 0.4-10 % by weight. During the homogenisation of the oxidised cellulose pulp wherein the fibres of the cellulose pulp are disintegrated into finer structures and partly the fibrils of the cellulose pulp are liberated. The homogenisation may be performed by mechanical treatment in an apparatus giving enough energy input by shearing and/or impact forces to refine or disintegrate the cellulose fibres and fibrils. The cellulose pulp obtained from step (a) can be homogenised by any known method wherein forces are applied to a cellulose pulp for refining the fibres, for example the cellulose pulp can be crushed or be exposed to high pressure by other means. The method and apparatus for the homogenisation are not critical for the process of the invention, provided that a sufficient degree of refining into the cellulose fibrils, i.e. disintegration of the oxidised fibres, is accomplished. There are commercial available high shear dispersers. The critical factor for the apparatus to be used may be the shearing and /or impact forces as are exerted on the oxidised pulp, an oxidised cellulose fibrillar network will be obtained. The mechanical energy required for refining the cellulose pulp is less than 10 kWh/kg, for example less than 5 kWh/kg, or less than 2 kWh/kg. The required energy input depends mainly on the cellulose pulp as starting material and the degree of oxidation achieved during the oxidation step (step (a)), but also on the efficiency of the specific equipment used. In general, the requirement of energy supply is less if higher degree of oxidation is applied. Depending on the starting material, the conditions during the oxidation step, and the requirement and purpose of the final product the mechanical treatment achieved during the oxidising step can be enough for liberating the cellulose fibrils. Also the mechanical treatment obtained by the apparatus and transport systems (including pumps etc) connected to the process may provide enough mechanical treatment. (c) drying of the cellulose pulp provided by step (b). In one embodiment of the invention an oxidised cellulose pulp fibrillar network obtainable by the process as defined in step (a) and step (b) as above is provided. By the process of the invention is an oxidised cellulose pulp fibrillar network suspension wherein the cellulose pulp comprises about 0.3 to 2.5 mmol carboxylic groups per gram cellulose pulp; and about 0.1 to 5.0 mmol aldehyde groups per gram cellulose pulp; and wherein the cellulose pulp comprises 0-50 % of fibres having an average length 0.7 mm - 2.1 mm (measured with Kajaani FS-300), and 50-100 % of fibres having a particle size of 0.05 -500 micrometer (measured with Malvern Mastersizer 2000) provided. In one embodiment of the invention an oxidised cellulose pulp fibrillar network is provided wherein at least 50 % of the cellulose pulp is of short fraction and that 50 % of this fraction has a particle size of less than 120 μηη; and 90% of the fraction has a particle size of less than 400 μηη. In one embodiment of the invention an oxidised cellulose pulp is provided wherein at least 70 % of the cellulose pulp is of short fraction and that 50 % of this fraction has a particle size of less than 120 μηη; and 90% of the fraction has a particle size of less than 350 μηη. The cellulose pulp comprises a 'liquid system' which is herein defined as a water based system comprising at least 50 % by volume of water. The liquid system may in addition to the water also contain polar solvents such as alcohols, ketones. Examples of suitable polar solvents are lower alcohols like methanol (CH3OH), ethanol (CH3CH2OH) and isopropanol (CH3)2CHOH; and ketones like acetone (CH3COCH3). The list of polar solvents suitable to be mixed with water in the liquid system is not exhaustive. The liquid system may comprise 50, 55, 60, 65, 70, 75, 80, 85, 90, 95, 96, 97, 98, 99, or 100 v/v % water and 0, 1 , 2, 3, 4, 5, 10, 15, 20, 25, 30, 35, 40, 45, 50 v/v % of polar solvent. The liquid system may be selected to be of the same composition during the whole process, during the oxidation step as well as the homogenisation step. However, in a process including an oxidation process comprising 2,2,6,6- tetramethylpiperidin-1 -oxyl it is preferred to select a liquid system not including any alcohol during the oxidation step, for example water is the preferred liquid system. If the liquid system is to be selected to contain the same components during the whole chain of reaction steps, thus to be used both during the oxidation step (step (a)) and during the homogenisation (step (b)) it is preferred to avoid alcohols as the alcohol then also is to be oxidised during the step (a), the oxidation. Preferably, the liquid system during the oxidation of the cellulose pulp, thus during the step (a) comprises 100 % water. Then, the liquid system added after the step of dewatering and washing may comprise water and an amount of the polar solvent. It might be an advantage to add a specific amount of polar solvent during the homogenisation as the viscosity of the suspension can be modified which results in that less energy input is required for the process. Also, the energy input required during the drying process, thus in step (c), may be optimised by selecting suitable components in the liquid system. The cellulose pulp fibrillar network obtained after the step of homogenisation may be dried in numerous ways, non-limiting examples of drying methods are freeze drying, spray drying, air- or gas drying, steam drying. The final product, thus the product after the step of drying (step (c)), obtainable by the process of the invention is dependent on how the drying in step (c) is performed. In one embodiment of the invention is a cellulosic absorbent product comprising the oxidised cellulose pulp obtainable by the process as defined in step (a) to step (c) as above provided. (a) alternatively after step (b). The liquid system is sublimated directly from the frozen state of the pulp. Any commercially available method may be used. Another example of freezing is by liquid nitrogen. The material obtained after the freeze drying may be very porous and sponge like, and may have a structure which range from a quite ordinary fibre network to a non transparent foam. In one embodiment of the process of the invention the drying step (c) is performed by freeze drying. In one embodiment a cellulosic absorbent product is provided being a fibrillar network characterized in having a surface area (BET surface area) of at least 25 m2/g, and a total pore volume of between 5-500 cm3/g. Preferably the surface area is of at least 30 m2/g. Preferably, the total pore volume is of between 10-200 cm3/g, for example between 20-100 cm3/g. In one embodiment a cellulosic absorbent product is provided being a freeze dried fibrillar network characterized in having a surface area (BET surface area) of at least 25 m2/g, and a total pore volume of between 5-500 cm3/g. Preferably the surface area is of at least 30 m2/g. Preferably, the total pore volume is of between 10-200 cm3/g, for example between 20-100 cm3/g. By the term 'surface area' and 'BET surface area' it is meant a measure of the accessible area of the cellulosic absorbent product. This is a way of quantifying the total amount of solid surface provided by the cellulosic absorbent material. A method to measure the BET surface area is further described in P A Webb and C Orr, Analytical Methods in Fine Particle Technology, 1 st ed. Norcross: Micrometrics Instrument Corporation, 1997, and is herein incorporated by reference. Other options for drying the cellulose pulp are by air- or gas drying. This drying process can be performed by any known air- or gas drying methods and apparatus. The air- or gas drying of the cellulose pulp may be conducted at elevated or atmospheric pressure. Examples of air- and gas drying processes are spray drying, fluid bed drying, rotary drier, tunnel air drier, and conveyor drier. In these methods common air can be used, or alternative, a gas. Examples of suitable gases for drying the cellulose pulp are nitrogen gas, flue gas, and overheated steam. The process of air- or gas-drying can be performed in room temperature, or be forced by an elevated temperature of for example 30, 50 or 70 °C. The air- or gas drying may also be performed at temperatures of up to 105 °C, or even up to 180 °C. In one embodiment of the process of the invention the drying step (c) is performed by air- or gas drying. In one embodiment a cellulosic absorbent product is provided being a fibrillar network characterized in having a surface area (BET surface area) of 0.1 to 2.0 m2/g, preferably of 0.1 to 2.0 m2/g, and a water absorption capacity of at least 15 g/g. Preferably, the surface area (BET surface area) is of 0.2 to 0.8 m2/g. In one embodiment a cellulosic absorbent product is provided being an air dried fibrillar network characterized in having a surface area (BET surface area) of 0.1 to 2.0 m2/g, preferably of 0.1 to 2.0 m2/g, and a water absorption capacity of at least 15 g/g. Preferably, the surface area (BET surface area) is of 0.2 to 0.8 m2/g. The present invention provides possibilities to provide a range of cellulosic absorbent products with different properties, but with a high absorption capacity in common. By combining the specific parameters for the treatment of the cellulose pulp by the oxidation with the parameters for the homogenisation, the ratio of short fibres and long fibres of the cellulose fibres, the properties can be changed. It is possible to determine the structure of the foam by careful selection of parameters such as level of oxidation in step (a) and the level of homogenisation in step (b). Depending on the drying process of step (c) there are possibilities to provide absorbent products in form of, for example, porous foam, compressed porous foam, granules, pressed granules, thin film, powder, and porous sandwich structure. For example, an absorbent material in form of film can be obtained by air drying of the pulp of step (b). This film may be a thin semitransparent film of absorbent material when the pulp is poured on a suitable mean, such as a plate, and air dried at room temperature and at atmospheric pressure. The transparency of the obtained product can vary depending on the starting material, the degree of oxidation, the mechanical treatment and the final drying process. This is further described by the Examples. A cellulosic absorbent product in form of a foam or sponge may be obtained by a freeze drying method. The aldehyde and carboxylic groups imparted to the cellulosic pulp according to step (a) remain even after the pulp has been subjected to the homogenisation according to step (b) and the drying according to step (c). The aldehyde groups generated by the process according to step (a), thus the oxidation, serve to enhance to stability of the material by forming covalent bonds within and between the cellulose polymers (inter- and intrafibrillar), thus crosslinks are formed within the fibrillar network. These strong bonds are important for preservation of the three-dimensional structure as are obtained by the drying step (step (c)) and gives an improved mechanical strength of the product which is an important aspect for some applications of the cellulosic absorbent product. Figure 1 - SEM micrograph of the freeze dried oxidised cellulose pulp as obtained in Example 5, mechanically treated for 10 minutes; magnification 350x, scalebar 100μηι. Figure 2 - SEM micrograph of the freeze dried oxidised cellulose pulp as obtained in Example 6, mechanically treated for 10 minutes; magnification 350x, scalebar 100μηι. Figure 3 - SEM micrograph of the freeze dried oxidised cellulose pulp as obtained in Example 8, mechanically treated for 10 minutes; magnification 370x, scalebar 100μηι. Comment: An additional white scalebar (same length as the original scalebar) was added to Figure 1 , 2, and 3. It has been placed so that both scalebars (original grey and new white) are visible in these figures. The invention is further shown by the following examples. The source and quality grade of the chemical components, added according to the Examples, for the process is listed in Table 1 . The charge of chemicals in the examples is written as charge of theoretically pure chemicals. Therefore the actual charge must be calculated to compensate for the impurities in the different chemicals. The available chlorine in the sodium hypochlorite solution was determined before each oxidation experiment. A solution (1.20 L) containing 0.1 mM 2,2,6,6-Tetramethylpiperidin-1 -oxyl, free radical (Tempo) and 1 mM NaBr (sodium bromide) was prepared. 12.0 g (oven dried (o.d.)) of the cellulose pulp as starting material was added to the solution. After the pulp was added the suspension was adjusted to pH 10 with 1 M NaOH. The free radical reaction was started by adding a certain amount of sodium hypochlorite solution (NaOCI) solution (defined in table below) and adjusted to pH 10. The free radical reaction was carried out at room temperature (20°C). The suspension was continuously stirred using a magnetic stirrer. The pH was maintained between 9.75 and 10.25 during the reaction by adding 1 M NaOH drop wise. The reaction was stopped then no further decrease in pH was observed. The reaction time was longer with high dosage of NaOCI, with a maximum of 150 min at 5 mmol NaOCI/g cellulose pulp. After the reaction, the pulp suspension was placed in a Buchner funnel with a nylon web (length between wires: 200μη"ΐ, diameter of wires: 400μη"ΐ) and the liquid was separated from the oxidized pulp. The separation was repeated once by returning the filtrate. By adding different amounts of NaOCI according to Examples 1 to 4 above, cellulose pulps with different content of aldehyde- and carboxylic-groups were obtained. The content of carboxylic groups for the different pulps according to Examples 1 to 4 was analysed. The measurements were conducted with sorption of methylene blue. 0.05g (oven dried). The cellulose pulps according to Examples 1 to 4 were added to a beaker with 10OmL 0,01 HCI. The suspension was stirred for 1 h with a magnetic stirrer. After that, the pulp was washed with HCI (50ml_, 0.01 M) and deionised water. The water in the sample was carefully dewatered, before the sample was added to a beaker together with 10OmL of buffer containing methylene blue (0.002M NaH2P04, 0.0078M Na2HP04 (buffer adjusted to pH 7.8), 0,4798g methylene blue, and deionised water to a total volume of 1 .00L). The sorption time was 1 h and conducted in darkness. The reaction mix was then filtered and the filtrate was diluted 125 times its original volume and analyzed on a spectrophotometer (Hitachi U-3200). The absorbance was measured at 664nm and the absorbance adjusted by dilution so that the absorbance was between 0.2- 0.8. The fibres were collected on a filter paper and were then washed with 200ml_ of 0.01 M HCI to desorb the methylene blue from the fibres. The fibres were further washed with deionised water, dried in an oven at 105°C for at least 4 hours, and then the weight of the fibres were measured. The amount of carboxylic groups were calculated based on the consumption of methylene blue and the fibre weight. The method is further described in P Fardim, B Holmbom, J Karhu, Nordic Pulp and Paper Research Journal, 2002, 17:2, 346-351 , which is incorporated by reference. 0.1 15g 0.05mM NaOH. The suspension was poured into a plastic bag and the plastic bag was put in a water bath (60°C) for 2 hours. During the reaction carbonyl groups was reduced to hydroxyl groups. After the reaction time was ended the cellulose pulp was cooled by dilution with cold water and then the sample was dewatered and washed with deionized water. The pulps obtained from the above Examples 1 to 4 were further treated by mechanical treatment as follows. 5.0 g of the free radical oxidised pulps prepared in Examples 1 to 4 were suspended with water to a suspension having solid content of 1 %. The pulp was homogenised, the fibres in the pulp was disintegrated into finer structures by a high shear laboratory batch mixer (Ultra-Turrax T 45/N (IKA WERK)) speed: 10 000 rpm, rotor diameter: 40mm, stator diameter: 45mm. 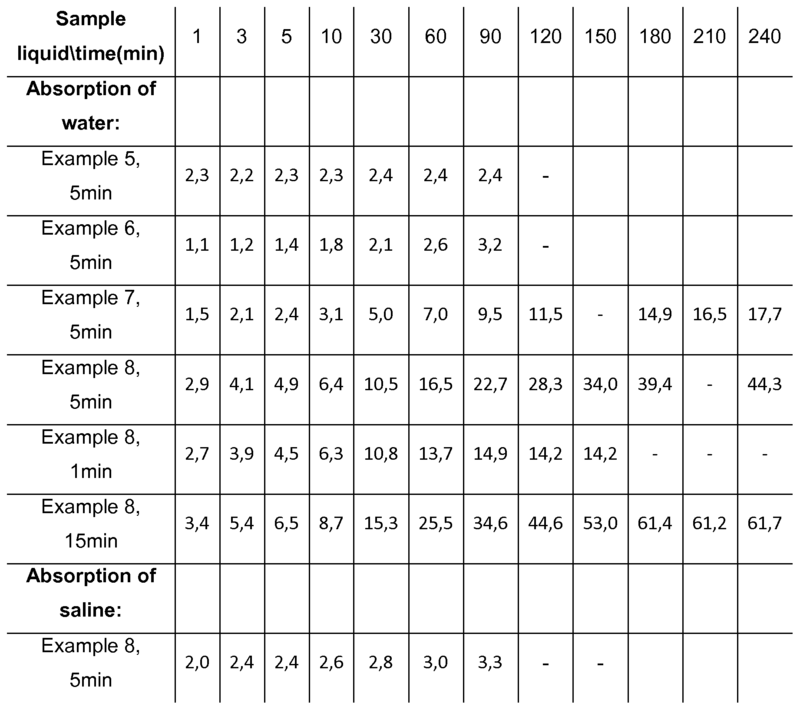 Samples were collected after 1 , 3, 5, 10 and 15 minutes and the solid content of them were tested (table 2). All durations of mechanical treatment in the examples in this document are based on 5g of solid material. As the homogenisation of the material progresses, the viscosity of the suspension increases. In Examples 7 and 8 the suspensions became too viscous so that dead zones were created in the sample beaker. To provide a good mixing of the entire volume of these samples, they were diluted with a portion of deionised water, as defined in Table 2, to enable further treatment. During the treatment liberated fibrils are dissolved because of their high content of carboxylic groups. Fractionation of long and short fibres was conducted in order to show the relative ease of refining of the fibres. 10g of the homogenised oxidised cellulose pulp according to Examples 5 to 9 having a concentration between 0.5-1 % by weight cellulose pulp, was added to a beaker. 80 ml of deionised water and 10ml of 0.1 M HCI was added to beaker with the pulp. This suspension was stirred with a magnetic stirrer for 1 h to protonize the carboxylic groups. As the free carboxylic groups in the sample were protonized by hydrogen ions, the solubility of the liberated fibrils in the pulp sample was decreased. After that treatment was finished the pH was set to 7 by adding 0.5M NaOH drop wise. To decide the amount of long fibres remaining after the mechanical treatment step, long and average long fibres (long fraction) were separated from short fibres (short fraction) by a Dynamic Drainage Jar. The Dynamic Drainage Jar, manufactured by Paper Research Materials, consists of a vessel with a stirring device, a metallic screen with conical holes (metallic screen 40M was used which is about equivalent to an ordinary quadratic 50 Mesh net) and plastic tube in the bottom to collect the filtrate (no bottom glass cone were used). The ion exchanged sample was diluted with a total volume of approximately 500ml_ using deionised water. The diluted sample was added to the drainage vessel (bottom tube closed) and stirring was started for 15s at 1500 rpm (revolutions per minute). After that the stirring speed was adjusted to 750 rpm and the bottom tube was opened so the water and the short fraction could be drained into a beaker. After the drainage, the short fraction and the long fraction were collected and both were diluted to a total weight of each suspension of 500g. Measurements were also conducted to determine the length weighted average fibre length for both the long fraction and the short fraction. The equipment used for this analysis was a Kajaani FS-300 fibre analyzer, manufactured by Metso automation, which measure and calculate the average fibre length in the range 0-7.6 mm, at least 10 OOOpcs were measured (further data regarding this device could be found in Kajaani Owner's manual K01307V1.3EN). Suitable amount of suspension was added to a beaker and tested in the fibre analyzer. The amount of suspension varied between 25ml_ and 150ml_ depending on the amount of fibres in the suspensions. The suspensions were mixed with a spoon and sample was taken out at different levels and positions with a glass pipette to get a representative sample. To get a better view of the particle size distribution of the short fraction a Malvern Mastersize 2000 manufactured by Malvern Instruments, size range: 0.02- 2000μηΊ, dispersant: deionised water (Rl:1.33), Particle: Default (Rl:1 .52, Abs:0.1 ), the results were reported in volume, other information about this instrument can be found in Mastersizer 2000 user manual MAN0384 issue 1 .0. This instrument was used to get a measurement of particle size. The Malvern Mastersize 2000 calculate all measured particles as equivalent spheres. This means that the value of particle size is not the real dimension of the particles in the sample but rather a size equivalent to the size of the particles in the sample. The values obtained herein are all connected to the measurement methods used herein. The sample was taken out from the suspension as described previously for fibre analysis. Analysis was conducted with default settings. Gravimetric determination of solid material in each fraction was conducted with the remaining part of the suspension. A Buchner funnel and two 9mm filter paper (Munktell's, No 0) was used to separate the solid and the liquid phase. The solids and the filter paper at the top were dried at 105°C for at least 4h. After that, the weight was determined and the size of the fractions was calculated with corrections for the suspensions used in previous analysis. Reference examples were also performed wherein the 'Reference pulp Γ was the starting softwood cellulose pulp, and 'Reference pulp ΙΓ was the starting softwood cellulose pulp which had passed mechanical treatment during 15 minutes. The result was collected in Table 3, percentage (%) of long and short fractions (mm) and the average fibre length (mm) of these fractions. The result shows the content of long fibres is reduced both by increased mechanical treatment and by increased oxidation treatment. At low levels of oxidation, example 5, the size of the particles in the short fraction increases due to the fact that more material has entered the short fraction compared with Reference pulp I. Further, at high level of oxidation, example 8, the entrance of new material into the short fraction is rapid at the beginning, but slower at the end of the mechanical treatment. Because of this the size of the particles is first increased and then after 10 minutes a decrease in size can be seen. At high level of oxidation a large part of the total sample belongs to the short fraction and the size of the particles is small. The cellulose pulps were then dried into the final absorbent product. Samples of the pulps obtained in Examples 5 to 8 (oxidised as defined in Table 4) were all freeze dried. The samples were put in glass beakers and were freeze rapidly in liquid nitrogen. Then the samples were placed in a freeze dryer, pressure 0.3-0.5mbar, the water were removed by sublimation. The time of drying was 60 hours to ensure that the samples were dry. Micrometrics Instrument Corporation, 1997, and is herein incorporated by reference. The total pore volume in the dried materials was calculated according to the equation below. The dimensions of the dried samples and the dry weight were measured. The density of the solid material of the samples was approximated to 1 .6 g/cm3. 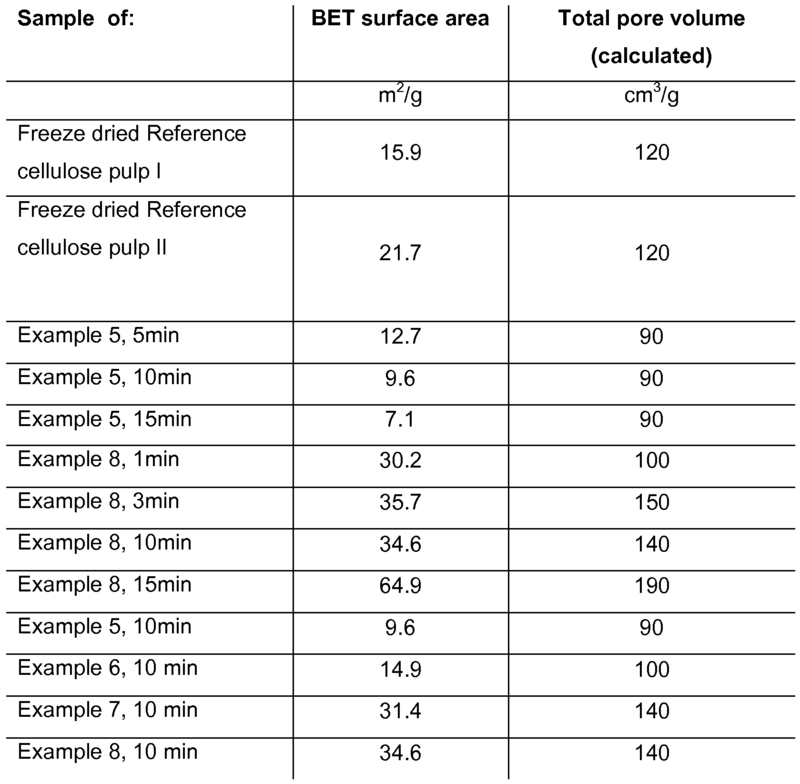 Table 5: BET surface area and total pore volume of freeze dried samples. A large surface area indicates that the material has a large area available for absorption of liquids. The result implies that a certain level of oxidation is necessary to be able to increase the surface area compared to the freeze dried reference samples. That level has been reached for the samples of example 7 and 8. It can also be seen that the surface area are favoured by increased level of oxidation and level of mechanical treatment. The total pore volume is mostly dependent on the solid content before the step of freeze drying. Some shrinking during the drying process may also occur. The numbers for the total pore volume has been rounded to the nearest tens. Scanning Electron microscopy was used to study the structure of the freeze dried materials. A sample was prepared by first taking out a small sample of freeze dried homogenised tempo oxidised cellulose pulp from a freeze dried sample. Then the surfaces of the sample were sputtered with approximately 20 nm thick layer of gold ions with a JEOL JFC-1 100E ion sputter, ion current: DC 10 mA, 3min. After the coating step, the samples stubs were placed in a JEOL JSM-820 scanning microscope at acceleration voltage of 20 kV. The experiments were conducted in deionised water and some samples also in 1 .0% by weight of NaCI solution. The dry weight of the sample was measured. Then, the sample was lowered into a beaker at time zero and was allowed to absorb for 1 min, then the clock was stopped and the sample was taken from the solution, free water were allowed to drip of and the weight was measured. After that the sample was put back into the beaker and the clock was started again. The same procedure was used for the other measurements. The experiments were conducted on the foam as was obtained in Example 8, with mechanical treatment in 15 minutes. Corresponding tests were conducted on compressed foam, the sample of Example 8, 15 minutes the foam was compressed to a volume less than 10 % of that of the original foam. Table 6: The values are given as weight of liquid per initial weight of the freeze dried sample. Sample 1 (Example 12 A): The cellulose pulp according to Example 8, 15 min. Sample 2 (Example 12 B): The cellulose pulp according to Example 12 A but treated with sodium borohydride before mechanical treatment. Sample 3 (Example 12 C): Cellulose pulp with no oxidation treatment, with 120min mechanical treatment. All three samples were put in beakers with a large excess of water. Sample 1 recovered to its original size and shape after an initial shrinkage during the rapid intake of water. The hemiacetal bonds formed in this sample, due to high content of aldehyde groups results in a stable fibril network in the wet state. The size and shape of the sample also recovers after a compression in its wet stage to 20% its height indicating that the fibril network is held together by strong bonds. In sample 2, with a much lower content of aldehyde groups, the sample returned to a gel-like state after wetting. A compression of this network broke the sample into several pieces. Sample 3 were completely dispersed when the sample was wetted. This indicates that this sample do not have bonds to preserve the fibril network in the presence of water. Samples of the pulps obtained in Examples 5 to 8 (1 , 3, 5, 10 and 15 minutes as above) were poured out on a plastic plate to produce films with dry surface weight 30g/m2. The samples were dried in air at room temperature (relative humidity 60%, 21 °C) for four days until the samples were air dry. The product obtained after the air drying was thin films with different amount of fibres present depending on the treatment during the oxidation step as well as in the mechanical treatment. The samples which had been exposed to high level of oxidation and mechanical treatment were very even and appeared as almost transparent. The absorption capacity of water and saline solution of the air dried products obtained was measured following the method described in connection with the freeze drying. Table 7: The values are given as weight (gram) of liquid per initial weight (gram) of the air dried sample. From table 6 it is shown that the capacity of the product obtained in Exampl 8 with 15 minutes mechanical treatment was 61 ,7. It is clear that for air dried films the water absorption capacity is favoured by high level of oxidation and mechanical treatment during long time. The absorption capacity tested with saline shows that lower amounts of saline in comparison with water is absorbed. BET surface area was measured according to Example 1 1 , beside that the single point measurement (at relative pressure 0.30) was used to calculate the BET surface area. The result shows that the films have a small BET surface area. This implies that the film are compact and do not have much surface available for absorption of liquids or moisture. Therefore the liquid absorption speed is slower for the air dried films when compared to the freeze dried samples. Having now fully described this invention it will be appreciated by those skilled in the art that the same can be performed within a wide range of equivalent parameters. The variations to the disclosed embodiments can be understood and effected by those skilled in the art in practicing the claimed invention, from studying the disclosure and appended claims, and without departing from the gist and scope of the invention and without undue experimentation. This application is intended to cover any variations, uses, or adaptations of the invention following, in general, the principles of the invention and including such departures from the present disclosure as come within known or customary practice within the art to which the invention pertains and as may be applied to. (b) homogenisation of the cellulose pulp of step (a) wherein the cellulose fibres are refined to provide a cellulose pulp comprising 0-50 % of fibres having an average length 0.7 mm - 2.1 mm (measured with Kajaani FS-300); and 50-100 % of fibres having a particle size of 0.05 -500 micrometer (μηη) (measured with Malvern Mastersizer 2000). (c) drying of the cellulose pulp provided by step (b) to provide a cellulosic absorbent product. 4. The process according to claim 3, wherein steps 1 ) to 4) are performed either simultaneously; in any order; or sequentially step 1 ) to step 4). 30 mmol/g cellulose pulp (oven dried). 6. The process according to claim 3, wherein the concentration of the oxidising agent is about 0.5 to 50 mmol / g cellulose pulp (oven dried); preferably about 1 to 30 mmol/g cellulose pulp (oven dried); further preferably about 1 to 10 mmol / g cellulose pulp (oven dried). 7. The process according to claim 3, wherein the oxidising agent is selected from the group consisting of lithium hypochlorite (LiOCI), potassium hypochlorite (KOCI), sodium hypochlorite (NaOCI) and calcium hypochlorite (Ca(OCI)2). 8. The process according to claim 7, wherein oxidising agent is sodium hypochlorite (NaOCI). 9. The process according to claim 3, wherein the catalytic amount of the catalytic agent is about 0.005-5 mmol / g cellulose pulp (oven dried); preferably about 0.01 - 3 mmol/g cellulose pulp (oven dried). 10. The process according to claim 3, wherein the catalytic amount of the catalytic agent is about 0.01 -0.50 mmol / g cellulose pulp (oven dried). 1 1 . The process according to claim 3, wherein the catalytic agent is 2,2,6,6- tetramethylpiperidin-1 -oxyl (Tempo). 12. The process according to claim 3, wherein the solution of step 1 ) further comprises a co-catalyst. 13. The process according to claim 12, wherein the concentration of the co- catalyst is 0.005-50 mmol/g cellulose pulp (oven dried); preferably 0.5-20 mmol/g; further preferably 0.2-10 mmol/g. 14. The process according to claim 12, wherein the co-catalyst is an alkali metal bromide, preferably sodium bromide (NaBr). 15. The process according to claim 2, wherein the drying is performed by freeze drying. 16. The process according to claim 2, wherein the drying is performed by air- or gas drying. 17. An oxidised cellulose pulp fibrillar network suspension, wherein the cellulose pulp comprises about 0.3 to 2.5 mmol carboxylic groups per gram cellulose pulp; and about 0.1 to 5.0 mmol aldehyde groups per gram cellulose pulp; and wherein the cellulose pulp comprises 0-50 % of fibres having an average length 0.7 mm - 2.1 mm (measured with Kajaani FS-300); and 50-100 % of fibres having a particle size of 0.05 -500 micrometer (μηη) (measured with Malvern Mastersizer 2000). (measured with Malvern Mastersizer 2000). 19. The oxidised cellulose pulp fibrillar network as defined in any of claims 17 or 18, wherein at least 50 % of the cellulose pulp is of short fraction and that 50 % of this fraction has a particle size of less than 120 μηη; and 90% of the fraction has a particle size of less than 400 μηη. 20. The oxidised cellulose pulp fibrillar network as defined in any of claims 17 or 18, wherein at least 70 % of the cellulose pulp is of short fraction and that 50 % of this fraction has a particle size of less than 120 μηη; and 90% of the fraction has a particle size of less than 350 μηη. 21 . A cellulosic absorbent product being a fibrillar network, characterized in having a surface area (BET surface area) of at least 25 m2/g, preferably of at least 30 m2/g; and a total pore volume of between 5-500 cm3/g, preferably of between 10- 200 cm3/g, preferably between 20-100 cm3/g. 22. A cellulosic absorbent product being a freeze dried fibrillar network produced by the process as defined in claim 15, characterized in having a surface area (BET surface area) of at least 25 m2/g, preferably of at least 30 m2/g; and a total pore volume of between 5-500 cm3/g, preferably of between 10-200 cm3/g, preferably between 20-100 cm3/g. 23. A cellulosic absorbent product being a fibrillar network, characterized in having a surface area (BET surface area) of 0.1 to 2.0 m2/g, preferably of 0.2 to 0.8 m2/g; and a water absorption capacity of at least 15 g/g. 24. A cellulosic absorbent product being an air- or gas dried fibrillar network produced by the process as defined in claim 16, characterized in having a surface area (BET surface area) of 0.1 to 2.0 m2/g, preferably of 0.2 to 0.8 m2/g; and a water absorption capacity of at least 15 g/g. 25. An oxidised cellulose pulp obtainable by the process as defined in claim 1 . 26. A cellulosic absorbent product obtainable by the process as defined in claim 2.